You're making tomorrow's music... so why settle for yesterday's interface? 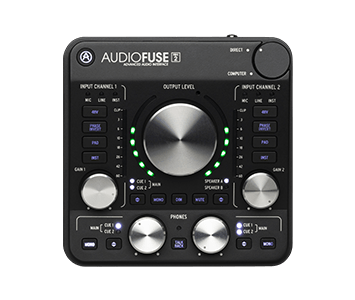 AudioFuse is the revolutionary pro audio interface that sets a new standard in sonic quality, creative production and value. It fuses the superior sound of high-end analog studio consoles with the flexibility of a solid mobile interface—with all the connectivity you need for any recording or performance. Learn all of the tips, tricks, and features that make Arturia's debut interface your perfect partner in crime. We take you through everything you need to know about AudioFuse in this careful guided tour to make sure you won't miss anything! In the first episode of our tutorial series on the AudioFuse, Guy Perchard runs us through the differences between the 4 unique power modes that this compact, powerful interface has to offer. In the 2nd episode of AudioFuse tutorial series, Guy Perchard shows us how simple it is to take advantage of the re-amping feature found in this versatile little interface. Watch the video and find out how to transform your guitar parts with the sound of real amps. In episode 3, Guy covers the simple process of setting up AudioFuse for archiving or listening to vinyl records, and shows you how to sample vinyl in your DAW. In just a few easy steps, Guy shows us how to quickly set up A/B speaker switching with AudioFuse so you can check how your mix sounds across different systems. Want to use all your lovely outboard, but your current interface doesn’t have the connectivity? AudioFuse is the answer! In this tutorial, Guy shows us how simple it is to integrate audio hardware using AudioFuse’s channel inserts. Want to multitrack drums, or maybe a whole band, but your current interface won’t let you? AudioFuse to the rescue! In the final episode of our AudioFuse tutorial series, Guy shows you how to use AudioFuse’s ADAT connectivity to track up to 8 more channels.